Developing markets has been the centerpiece of the U.S. Grains Council’s work since the organization was founded in 1960. Over the decades, the scope of these efforts has expanded from a focus on corn, sorghum and barley to incorporate co-products like distiller’s dried grains with solubles (DDGS). Now, the Council is also working around the world to expand ethanol use to meet growing demand from global partners to meet environmental commitments and benefit producers and consumers around the globe and in the United States. The start of almost all market development efforts begins with a broad assessment of existing opportunities and determining what strategy can best expand global demand. Like with other products, the macroeconomic outlook factors considered during the global assessment of ethanol market development potential include middle class growth and domestic agricultural/feedstock production and, more specific to ethanol, forecasted gasoline demand, current oxygenate use, country-level commitment to meeting Paris Agreement commitments or policy outlook. For some countries, the size of the market is simply too big to ignore, as is the case in Indonesia. Indonesia, which is forecast to be the sixth largest gasoline market by 2022, has a goal for renewables to represent 23 percent of its energy mix by 2025 and to reduce overall greenhouse gas emissions (GHG) by 29 percent by 2030. Ethanol has a great opportunity to support Indonesia in meeting these ambitious goals. In other cases, markets do not purchase U.S. ethanol, but do import ethanol from other countries. And in further situations, potential export partners may already be purchasing U.S. ethanol, but the Council had not previously engaged in formal market development work with local buyers, like in the United Arab Emirates (UAE). The UAE already imports a significant amount of ethanol from the United States. With exports totaling 45.4 million gallons (16.1 million bushels in corn equivalent), it was the sixth largest market for U.S. biofuel in 2016 and 2017. Based on ethanol import volumes, the country’s role as a supplier of finished gasoline to third country markets and forecasted growth in demand, the Council undertook a market assessment mission to the UAE to analyze the future opportunities for ethanol demand and engage with policymakers and industry officials. This type of on-the-ground market assessment gathers more nuanced information than an initial economic analysis and supports overall strategy development. To conduct overseas missions like this one, the Council and its partners travel to the country, working with local or regional USGC consultants as well as the U.S. Department of Agriculture’s Foreign Agricultural Service and others from the U.S. government working locally. The team engages with the government ministries of energy, environment and agriculture as well as with any industry associations, traders or ethanol blenders or producers. In many cases, the Council is bringing attention to the opportunities ethanol presents to help customers meet environmental and human health goals. This effort includes how ethanol can help a country meet Paris Climate Agreement commitments or just how affordable U.S. ethanol is as a source of octane, replacing other components of gasoline. In Canada, Ontario’s Climate Change Action, which includes GHG emission reductions of 15 percent by 2020, is bolstered by the recent provincial government announcement doubling blending requirements of ethanol in gasoline to 10 percent by 2020. The announcement further supports Canada’s nationally determined contributions to meeting commitments made following the COP21 Paris Agreement in 2015. After these high-level interactions, the Council provides technical education and expertise tailored to each market’s needs, similar to the Council’s work with grains. The Council relies on a strategic network for this technical expertise and frequently accesses existing bodies of research conducted to tailor these discussions to each market. For example, the Council established a team of recognized scientists who made multiple trips to Mexico to meet with policy makers and discuss the environmental benefits of ethanol blending. Together with the USDA and domestic partners, the Council assisted with two missions to Mexico and conducted a technical workshop on the benefits of fuel ethanol use. The first fuel regulation in Mexico allowed 5.8 percent blending by volume outside of three major cities and was later increased to 10 percent in June 2017. After the passage of this regulation, the Council was invited to hold a seat on the technical working committee tasked with implementation and possible revisions of the policy. Once a country makes the decision to revisit its existing ethanol policies or implement new mandates, the Council and its technical experts continue to be available to answer questions, resolve last-minute issues or to serve as subject matter experts. The Council also works with local industries to address trade and market constraints, offers price and cost information and helps illuminate market needs, including infrastructure. In Japan, the Council’s efforts focused on supporting the updating of the life cycle analysis for U.S. corn-based ethanol. The U.S. ethanol industry has improved considerably over the last decade in terms of reducing GHG emissions and the Council recognized this improvement as an opportunity to support Japan in meeting its stringent environmental goals. The Council’s office in Japan has worked closely, in coordination with U.S. industry partners, with the Japanese government and industry as they have updated a sustainability policy that will now allow imports of the oxygenate ETBE (ethyl tert-butyl ether) produced from U.S. corn-based ethanol as of April 2017. The new policy includes increased carbon intensity reduction requirements of the feedstock used to make ETBE – a 55 percent reduction compared to the previously required 50 percent as compared to gasoline. The new policy also recognizes the ability of corn-based, U.S.-produced ethanol to meet that goal, thanks to increased GHG emission reductions, the result of improvements in production efficiency as well as the emergence and use of co-products like DDGS. This type of work plants seeds for future outreach that includes a combination of market assessment, technical expertise, and assisting countries as they work to develop policies with a role for trade. For example, in Japan, USGC efforts in country are now shifting to active market development and laying the groundwork with local officials and private industry for new sales. 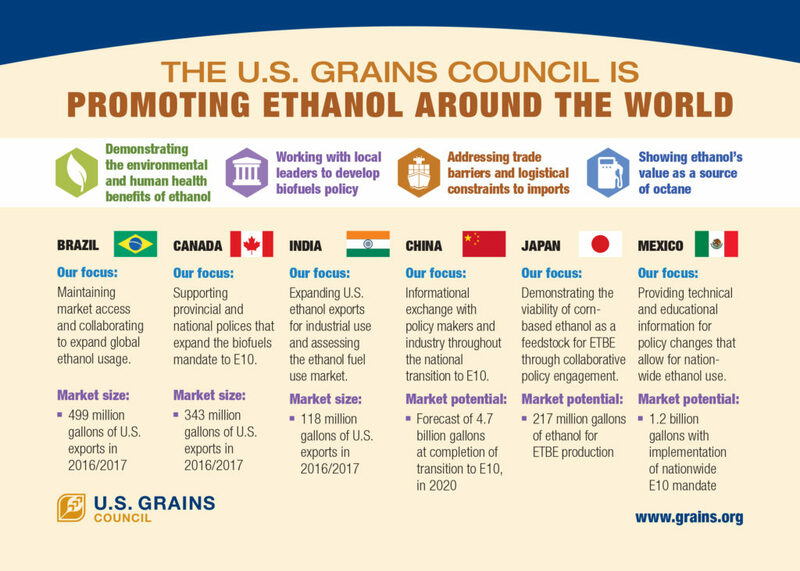 The Council’s goal is expanding the global ethanol market, by working with U.S. industry partners and global partners and being cognizant of the economic and political realities of each potential ethanol user. With a continued focus on assessing potential markets, exchanging technical information and developing policies with a role for trade, the Council is utilizing the expertise and market development process honed over decades to help establish a pathway for increased global ethanol use for decades to come.